All available online from Aviaeology's website. Interesting subjects well printed with minimum carrier film and perfect register. Bright and dull reds are both supplied. 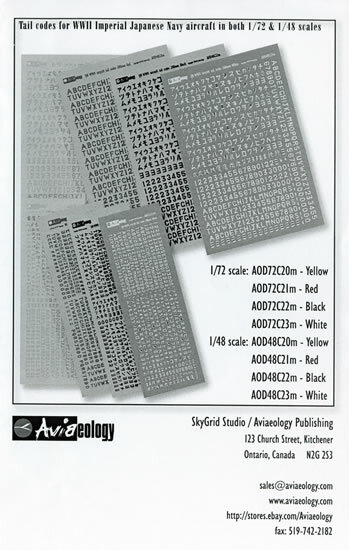 For the uninitiated, Aviaeology Decals are produced by SkyGrid Studios in Ontario, Canada. In the main, they concentrate on providing decals for machines operated by Canadian squadrons and pilots during WWII. 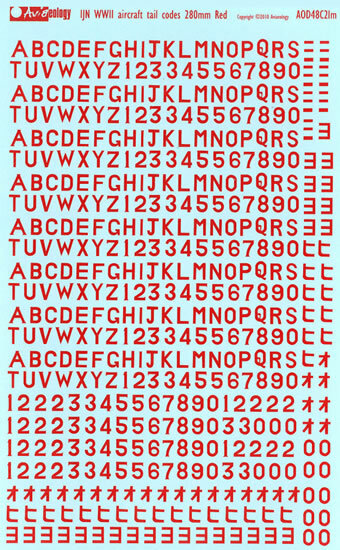 They also produce sheets of serials numbers and code letters. 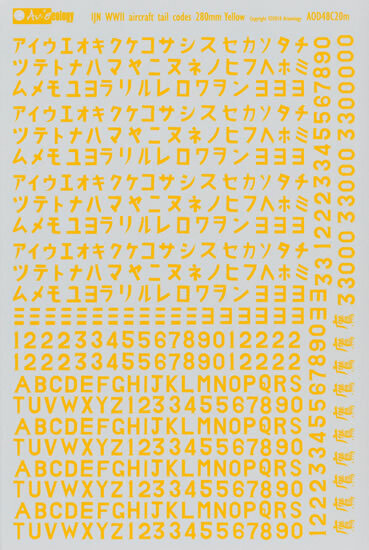 It is in this second category that that have released eight new sheets that carry tail codes for aircraft operated by the Imperial Japanese Navy during WWII. If you are a fan of WWII Imperial Japanese Navy Aircraft and model them you know how difficult it is trying to get a hold of suitable markings to allow you to model a particular machine. More often than not your only recourse was to use thick Hasegawa kit decals which stood out like the proverbial when used in conjunction with available after-market decals and or painted-on markings. Sometimes you could get away with using generic sheets from aftermarket manufactures where they came close or by cutting and overlaying decals. 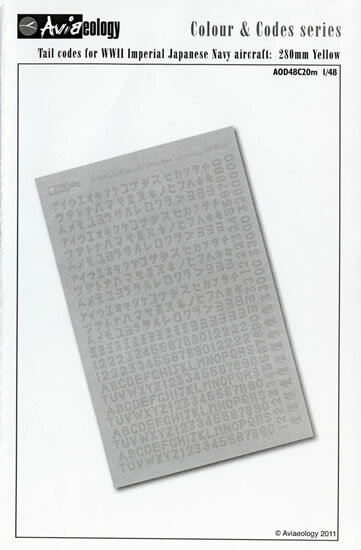 The specific and unique Japanese Katagana and Hirangana alphabet symbols however were another matter! Aviaeology has come to the rescue with these new sheets. 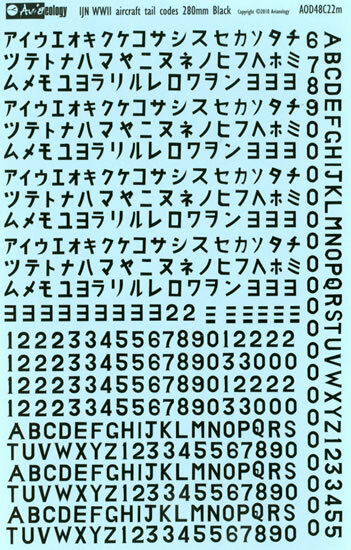 Each sheet is different and contains different letters and numerals but in general you get between 437 and 480 characters per 1/48 scale sheet and 450 for the 1/72 scale sheets. 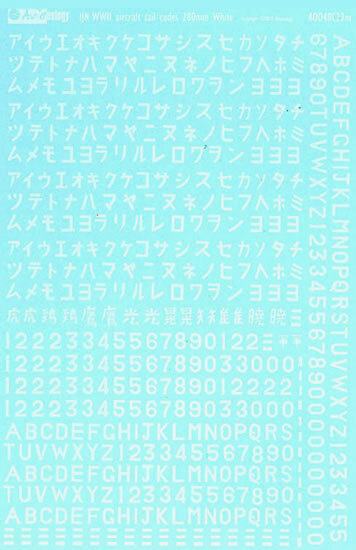 The characters and numbers are generally repeated eight times but not always so. The decals themselves are silk screen printed and surprisingly each item is separate in that the sheet is not printed on continuous carrier film which saves you from a tedious cutting out and trimming task when you come to use the decals. 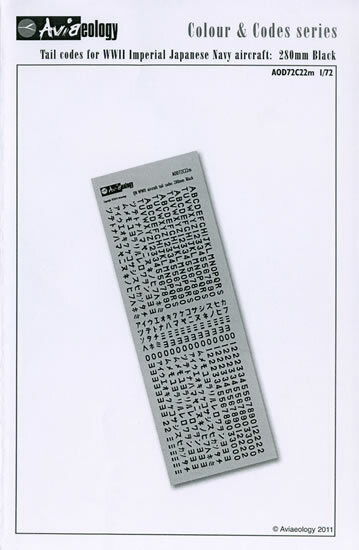 Each sheet comes with two A-4 sized sheets. 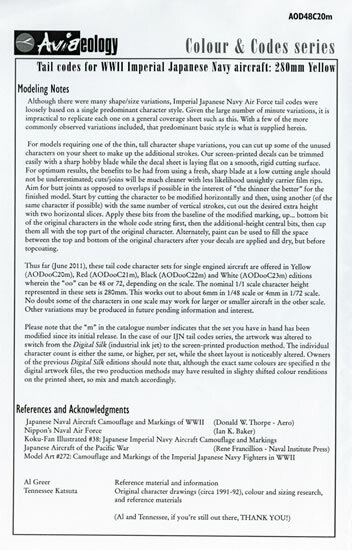 One holds modelling notes that provide a background to the series as well as guidance in how to modify the decals with the use of a scalpel to replicate letters and codes that are not provided on the sheets whilst the other holds very comprehensive notes on how to use the decals and a list of references used and acknowledgements to those who assisted in the realisation of the eight sheets. The sheets are obtainable direct from Aviaeology at www.aviaeology.com or from their E-Bay store at http://stores.ebay.com/Aviaeology . The decals and information sheets come packed in a clear plastic zip loc-bag. All up a great set of sheets from Aviaeology. 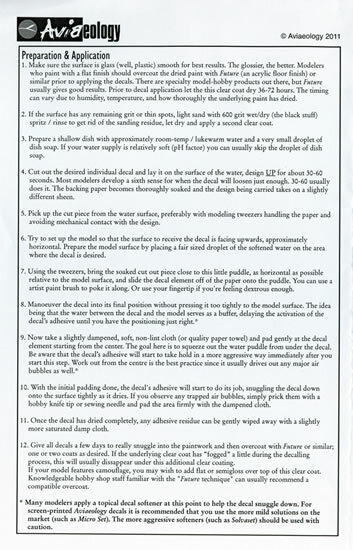 They are well researched, very well printed and will be welcomed with open arms by modellers of WWII Imperial Japanese Navy aviation.